ROCm-gdb v1.0 includes new features to assist application developers with understanding their application’s behavior. To get started with ROCm-gdb follow the installation directions and introductory tutorial in github. You can also view all the ROCm specific features using the command help rocm once you start ROCm-gdb. This tutorial focuses on two of the newest features in ROCm-gdb. One of the steps while debugging an application is finding the sequence of function calls that have occurred in a program. Understanding GPU kernel launch patterns is more challenging with compilers such as HCC which do not have an explicit API to dispatch kernels to the GPU. In HCC, kernels are generated from parallel_for_each loops. ROCm-gdb helps developers view information about kernels that have been launched on the GPU using the rocm trace and info commands. ROCm-gdb can save a trace of all the GPU kernel launches to a Comma Separated Value (CSV) file using the set rocm trace command. The following commands enable tracing GPU kernel launches to mytrace.csv. You can now execute and debug the application within ROCm-gdb. Anytime during the application’s execution you can view my_trace.csv to see the kernels have been dispatched. A sample trace for an application that dispatches a vector add kernel followed by a matrix multiplication kernel in a loop is shown below. Figure 1: A sample GPU kernel launch trace for an application that dispatches a vector addition and matrix multiplication in a for loop. The CSV file contains the dispatched kernel’s name, queue ID, dispatch dimensions and other useful information. To view a summary of the dispatches that have occurred, you can use the info rocm kernels command which provides a listing of all the kernels that have been dispatched, their dispatch counts and their dispatch dimensions. Figure 2 The info rocm kernels command shows information about the kernels and their dispatch counts. Disassembling ISA code is a critical component of any debugging toolchain. Viewing the ISA of a program can help application developers to detect bugs, estimate potential sources of overhead and understand the effects of compiler optimizations. 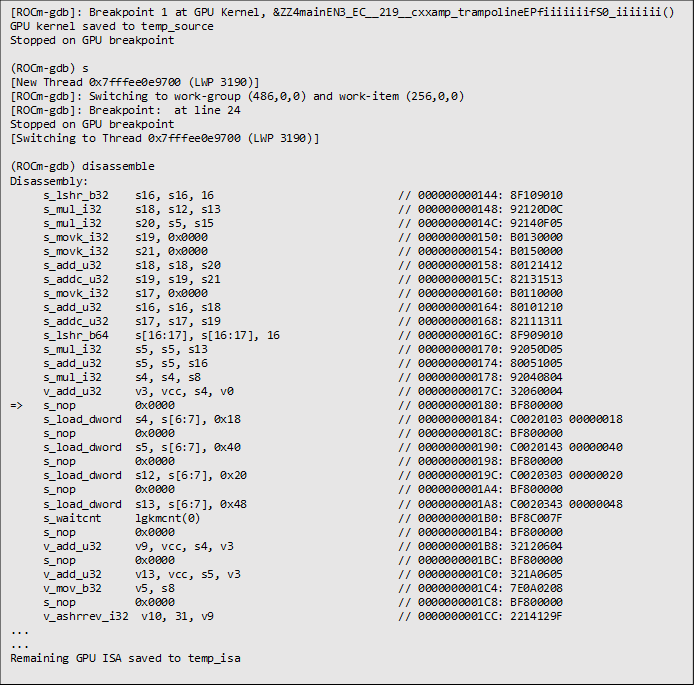 ROCm-gdb can now show GPU ISA for the kernel executing on the device using the disassemble command. The disassemble command’s output while executing a SAXPY kernel implemented in HCC is shown below. The Program Counter (PC) for the focus wave is shown with a (=>) prefix and some ISA instructions above and below the PC are shown. Figure 3 Disassembly for a HCC SAXPY kernel seen in ROCm-gdb. We have stepped into the kernel at line 24. Using the disassembly command we can view the GPU ISA around line 24. 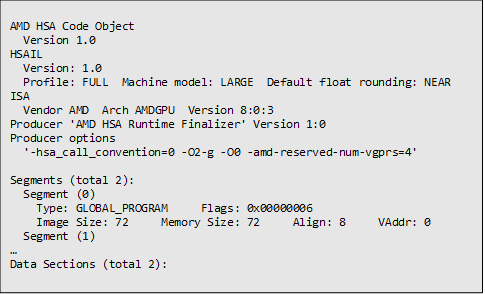 If you want to view the complete ISA for the GPU kernel, the ISA is saved to temp_isa. When no GPU kernel is executing, the disassemble command works as normal for CPU debugging. An alternative method of viewing the ISA for every kernel is the “set rocm” option to save the ISA to a file whenever a GPU kernel is active. This can be enabled using the set rocm show-isa as shown below. With this option, ROCm-gdb saves the ISA for the active kernel to temp_isa whenever a GPU kernel is active. Other than the GPU ISA, the disassembly in temp_isa also provides important information about the kernel such as the number of registers used, compiler flags used and the GPU ISA version. Figure 4 Information about the a GPU dispatch provided in temp_isa as part of the disassembly. We have seen how ROCm-gdb can be used to learn more about an application’s kernels using dispatch traces and a kernel’s execution by viewing the ISA disassembly. An important ability of these new features in ROCm-gdb is that they work even for applications compiled without debug information. Perhaad is an MTS with the AMD Developer Tools Group in Boston. He joined AMD in July 2013 and has worked on enabling Hardware debug capabilities in AMD developer tools. He is interested in simplifying the process of performance analysis and debugging using architectural advancements in modern GPUs and thereby enabling new application domains for heterogeneous devices. He graduated with his PhD from Northeastern University in 2014 and and is a co-author on the Heterogeneous Computing with OpenCL textbook. Links to third party sites are provided for convenience and unless explicitly stated, AMD is not responsible for the contents of such linked sites and no endorsement is implied. The GitHub page for ROCm-gdb says it currently only works for HSAIL kernels. Is it working for HC? Also, it says it is installed through ROCm. I updated to v1.1 of ROCm and do not seem to have the .deb packages? To install rocm-gdb, you presently need to do “sudo apt-get install rocm-gdb” once you have installed the rocm packages. The debugger is presently not installed when you do “sudo apt-get install rocm”. That may change in a future update to the rocm repository. My comment about “not have an explicit API…” meant that with HCC there is no function call such as clEnqueueNDRange() in OpenCL which clearly defines a GPU kernel. In that case it would be useful to know what were the kernels and their names. About support, ROCm-gdb presently supports HSAIL level debugging of HCC applications. The applications need to be built using the hcc-hsail compiler that is included with the rocm install. Once you build you application for debug as shown in (https://github.com/RadeonOpenCompute/ROCm-Debugger/blob/master/TUTORIAL.md), you should be able to debug at the HSAIL level. Thanks Perhaad. I wanted to edit my post after I submitted to say that I figured out what the confusion was. We use hcc-lc and it seems implied that support for debugging it is coming. We’ll wait for that, but thanks for detailing how to get it installed in the meantime. In hcc-lc we always implement kernels in a separate [[HC]] function called from the parallel_for_each so that part should be trivially easy for us.